The picture of your child stuck out at me, most likely because it was supposed to. After a recent and somewhat painful debate between a popular elocutor for science and a Young Earth Creationist, some of the Creationists put up images of their unanswered questions, written with markers on pieces of paper. One might think people for whom the written word is a fundamental absolute would get the difference between "your" and "you're," but maybe they're too focused on translating from the original Greek. Sigh. But snark I must not, because Lord knows I still regularly mangle "its" and "it's." So, of course, it could not end there. There was a 'net sign exchange, in which atheists pitched up their rebuttals and challenges, with counterquestions written in Sharpie on pieces of paper. Of the atheistic responses, yours was the one that leapt out. There was your daughter, smiling and bright eyed. These were not her assertions, of course, but likely assertions posed by you, her atheist parent. There was some subsequent net-kerfuffle about the use of a child as a public prop, but the way I figure it, you view religion as a fundamental threat to her integrity. I'm guessing you're the mom, too, given the handwriting. From your fierce mom-love and your anger at what you perceive as a threat to her, you want your beautiful kid out there, as the face of the debate. I'll admit to having struggled with that, myself, especially when it came to including her image in this post. I prefer to keep my children's faces off the net, particularly around contentious issues where net-trolls can and do say terrible things from the safety of their basement lairs. But I will follow your choice, and respect her integrity as a person in this post. She's great, of course, and looks like a charmer. I will take your black-marker list as a very legitimate descriptor of your hopes for your great little kid. Just looking at her, one can see that she is full of wonder, and smart, and full of potential, and beautiful, as all creation is. 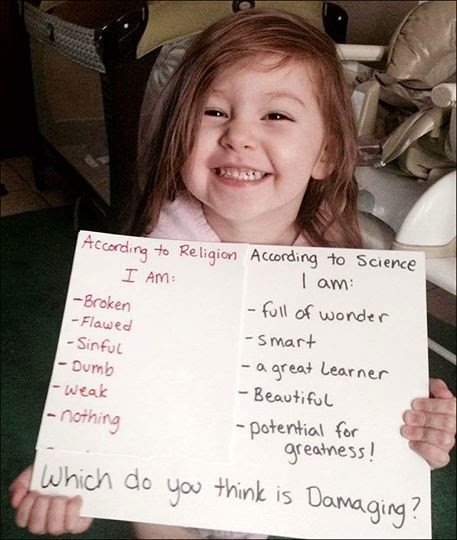 What such a delightful little sentient creature deserves, though, is our best swing at an accurate representation of things...and I'm not quite sure atheism is serving her well on that front, because atheism as a movement is not interested in truth so much as it is in refuting faith in all of its forms. It exists solely as a negation, after all, which means it has a problem with non-binary thinking. That can be observed in the statements in red-ink. "According to Religion," it begins, as if that's a single and univocal category. According to Buddhism, are the subsequent statements true? How about Hinduism? What about the Bahai? Or Unitarians? Or Wiccans? Is it true for Native American religious expression? Do Jews believe this? What about Muslims? Or Sikhs? None of the above, I'm afraid, if you understand how the concept of Sin plays out across human religious expression. It is an accurate statement for a painfully significant subset of global Christianity, most likely the subset that is the dominant culture in the area where you live. But even there, is this what some corners of American evangelical conservatism teach children about themselves? In some cases, yes, and that's a pity. As a Presbyterian Teaching Elder, I can tell you that it is not even close to how the old-line denominations teach our kids, not by a long shot. "Jesus loves you." "God loves you." "Here are some wild ancient stories with cool characters!" "Did we tell you you are loved? Well, you are." So is the red-marker-list accurate? No. And we owe our children our best shot at accurately representing the world. Then there's the list in black-ink. "According to Science," it says. But is the list that follows according to science? It is not. It is the romantic view of science held by most atheists, one that I can understand myself. Science is awesome and cool, a vital and essential human endeavor that opens our eyes to the ever-unfolding, incredible creation we inhabit. But "Wonder," "Beauty," and "Greatness?" These are not scientific terms. "According to science," one could just as easily describe that bright little child as a delivery system for replicating genetic material. Or as a complex organic machine, interacting with the world through a sequence of biologically and culturally mediated patterns, both learned and hard-wired. Her smile? The reflex of a social animal. The "love" felt for her by her biological parents? A neurochemical response to visual cues that identify her as a vulnerable near-infant, part of an evolutionary pattern that insures the aforementioned continuance of particular genetic traits. Her beauty? She is beautiful the way that everything is beautiful, meaning she is remarkably complex. From a purely scientific standpoint, her self-awareness is no more and no less beautiful than the amazingly intricate processes of digestion and excretion, or the processes of the human body as it decays following the cessation of life. You're not going to tell her that, presumably. You just tell her she is loved, and teach her to appreciate and marvel at the astounding reality around her, and tell her that she is great. But in that, I would ask you to consider allowing her to engage with the real complexities that are part of faith and religious practice. Where certain religious communities would bully and belittle and reduce her to nothing, don't allow them to do so. It's a fight worth having, and I'm there with you. But if you want her to grow up respecting your guidance, I'd encourage you to allow her to engage with the depth and subtlety of human existence. Binary thinking does not do that. Oh, and if you're actually Atheist Dad? Oops. Sorry for my assumption and generalization. You have very neat, rounded, lovely handwriting! Nothing to be ashamed of, and mea culpa. Still and all, everything I said still applies.